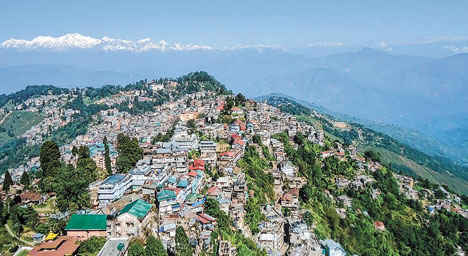 Siliguri: Tourism stakeholders hope that inflow of visitors to the Darjeeling hills will be normal during the coming summer season, months after tourists were forced to scramble out of their lodgings following the sudden resumption of the Gorkhaland movement. "The situation is completely normal in the hills now. We are confident that footfall of tourists will increase during the summer season and onwards. Our members have been receiving queries from different parts of India and even abroad. In fact, some tourists have already made their bookings," said Debashis Maitra, the president of the Eastern Himalaya Travel and Tour Operators' Association (EHTTOA). On Tuesday evening, the EHTTOA representatives elaborated on the "achievements" of the third edition of the Bengal Travel Mart that was held here from February 16 to 18. "There were over 11,000 B2B (business to business) meetings among buyers (people who send tourists) and sellers (local tour operators) at the event. The meets will have a positive impact on the tourism industry in north Bengal and indicates that buyers from across the country are interested in sending tourists here. Moreover, they were taken to familiarisation trips to the hills where they have seen that normality has completely been restored," Sandipan Ghosh, the EHTTOA secretary, said. In 2017, the 104-day long shutdown and agitation had a cascading effect on the industry that lost both the Durga Puja and winter seasons. An hotelier in Siliguri who has properties in the hills as well said the tour operators could regain confidence of domestic and international tourists to a considerable extent. "We are getting a good number of queries every day. Unlike the last four months of 2017, when the queries were few and reservations were even less, things have started improving over the past one month or so," he said. The stakeholders also pointed out that the two-day business meet that would be held in Darjeeling in the middle of March will also help the tourism industry. "The chief minister would be present, along with office-bearers of the GTA to invite entrepreneurs to invest in the hills. This effort will surely help us get more tourists," said the EHTTOA secretary. Further, visits of officials like the vice consul for consular affairs of the US Consulate General's office in Calcutta, Samantha Jordan, will encourage international tourists to come to Darjeeling, said the stakeholders. Jordan is currently on a visit to Darjeeling. Jordan, sources said, is visiting the region in continuation of the US Consulate General's efforts to build sustained engagement in north Bengal. U.S. consul general Craig Hall had visited Siliguri twice last year, in July and on November. As a part of her outreach, Jordan on Wednesday met some prominent people associated with travel trade in Darjeeling. "She wishes to assess the current situation and explore the tourism potential of Darjeeling," said a source. Tourism stakeholders hope that inflow of visitors to the Darjeeling hills will be normal during the coming summer season, months after tourists were forced to scramble out of their lodgings following the sudden resumption of the Gorkhaland movement.